Why are the benefits of mycorrhizal symbiosis so variable for plants? This project began with a conversation among myself, Nancy Johnson, and James Umbanhowar at the 4th International Conference on Mycorrhizae (ICOM), in Montreal in August of 2003. We were struck by the huge volume of papers being published containing data on how plants respond to inoculation with root-symbiotic mycorrhizal fungi, and by the pressing need for synthesis, especially to better understand why these nearly ubiquitous symbioses are sometimes really beneficial, sometimes weakly beneficial, and sometimes detrimental to plant performance. Our initial idea was that large-scale synthesis of data and theory around this puzzle could help reveal some general principles on the factors governing the outcomes of species interactions, especially nutritional symbioses like mycorrhizae, rhizobia, and corals. Happily, we were able to convince the National Center for Ecological Analysis & Synthesis (NCEAS, at the time a synthesis center funded by the USA's National Science Foundation) to support a working group on this topic. 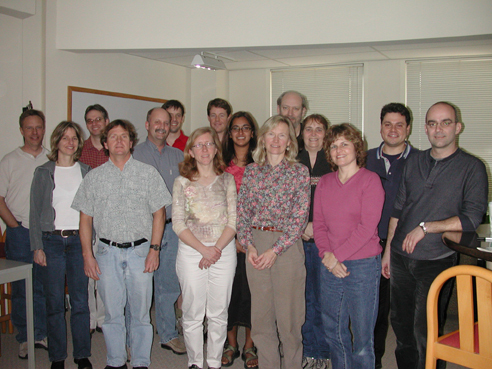 First mycorrhizal synthesis working group at NCEAS, January 2005. Front, left to right: Mark Schwartz, Cathy Zabinski, Nancy Johnson, John Klironomos. 2nd row, left to right: Suzanne Simard, John Moore, Bala Chaudhary, Gail Wilson, Peter Moutoglis. Back row, left to right: Bill Swenson, Jim Bever, James Umbanhowar, Jason Hoeksema, Mike Miller. 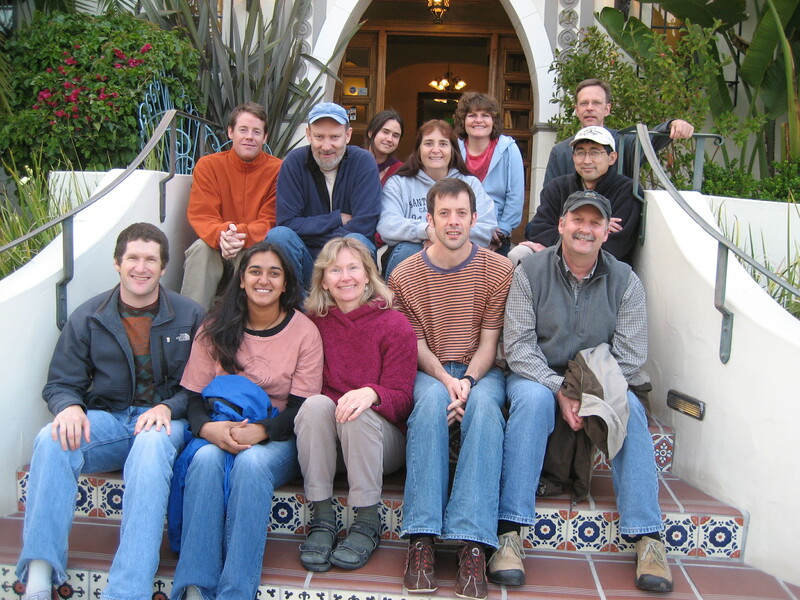 Fourth meeting of NCEAS working group, April 2007, Santa Barbara, California. Front, left to right: Lawrence Walters, Bala Chaudhary, Nancy Johnson, James Umbanhowar, John Moore. 2nd row, left to right: Jason Hoeksema, Mike Miller, Gail Wilson, Roger Koide. 3rd row, left to right: Anne Pringle, Kitty Gehring, Bill Swenson. 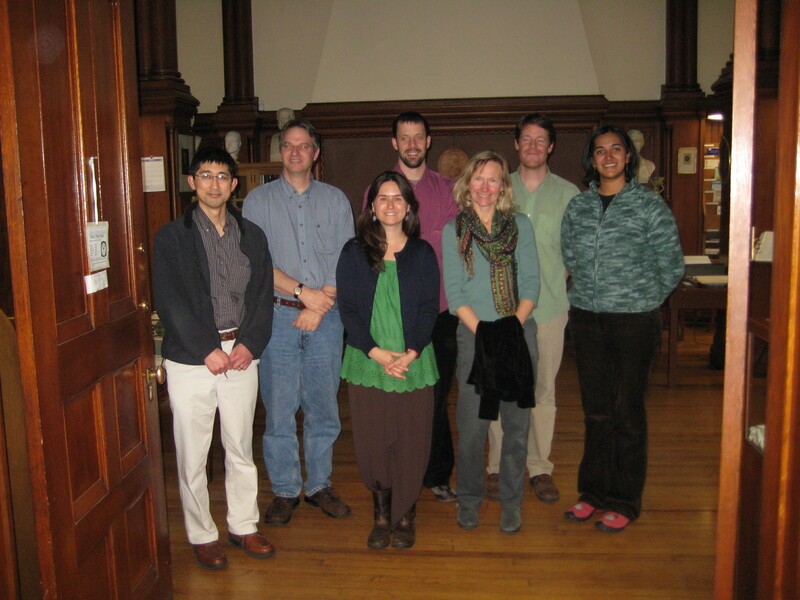 We convened a group of ~20 people, including professors, post-docs, students, and industry professionals, for four meetings between January 2005 and April 2007, and then held an additional meeting at the Radcliffe Institute in March of 2008. Those initial meetings produced a variety of products including a synthesis of models of mycorrhizal symbiosis1, a review highlighting potential problems with spreading mycorrhizal fungal inoculum around the world2, and an educational module on soil ecology3. But much of our effort was spent developing a database on mycorrhizal inoculation experiments, which we named MycoDB4. Our initial search of the Web of Science in January, 2005, found more than 1850 publications with potentially relevant data. We then began the laborious process of screening random subsets of those papers to find those with appropriate data, and developed standardized procedures (including a web interface) for extracting the data, including plant performance with and without mycorrhizal fungi, and especially potential explanatory factors that varied among studies. Justine Karst bolstered the dataset by adding data from a previous meta-analysis of ectomycorrhizal interactions5. Radcliffe Institute working group, March 2008, at the Harvard University Natural History Museum. Left to right: Roger Koide, Jim Bever, Anne Pringle, James Umbanhowar, Nancy Johnson, Jason Hoeksema, Bala Chaudhary. 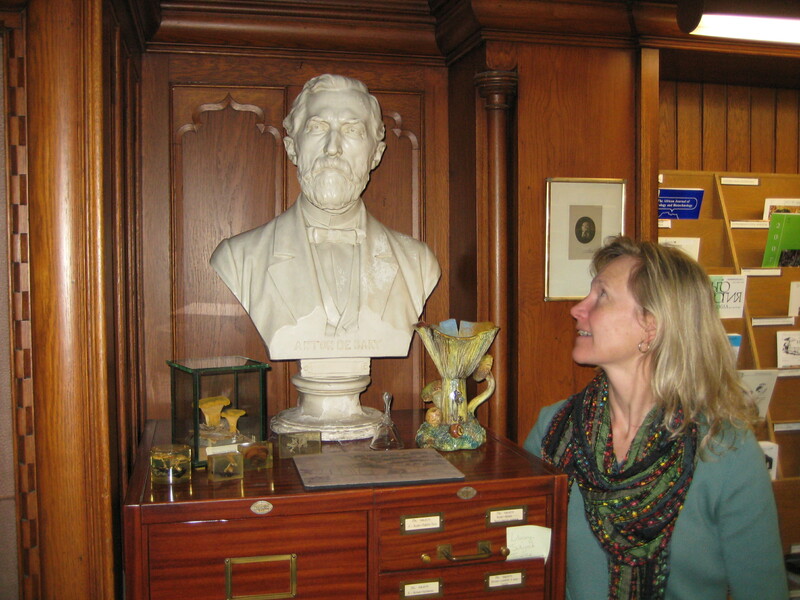 Nancy Johnson paying homage to Anton de Bary, who coined the term "symbiosis," at the Harvard University Natural History Museum, March 2008. We also worked to develop robust methods for conducting multi-factor meta-analysis (sometimes called "meta-regression" in the meta-analysis literature), with a metric of plant responsiveness to mycorrhizal fungi as the effect size (or response variable) and with a wide variety of abiotic and biotic factors that varied among studies as the candidate predictor variables. We knew we needed to use multi-factor statistical models, since one of our goals was to understand the relative importance of multiple factors in explaining the variable responses of plants to mycorrhizal fungi; using multi-factor models that simultaneously controlled for the influence of all important factors was essential. One of the big challenges we grappled with, however, was the observational nature of such meta-analysis data, in which the study-level predictor variables are typically somewhat correlated with each other, which can lead to spurious conclusions if p-values are used to test single predictors or to select a single multi-factor model using stepwise multiple regression. Thus, we developed an approach to application of AIC-based model selection and multi-model inference for mixed-model meta-analysis. Our first meta-analysis of the MycoDB database using this approach revealed that plant traits, nutrient fertilization, and non-mycorrhizal soil microbes were all important in explaining variable plant responses to mycorrhizal fungi6. Those initial results were unsatisfying in some important ways. First, limitations of the data prevented testing some potentially important factors, such as the interaction between P- and N-fertilization. Second, we did not assess the influence of plant or fungal phylogeny, and thus could not compare the relative magnitude of ecological context versus evolutionary history. We began to remedy these and other limitations in the data through a Distributed Graduate Seminar (DGS) project funded by NCEAS. This unique funding structure facilitated teaching a graduate course (in fall, 2010) on meta-analysis to more than 50 students across 9 university campuses in the USA and Canada. 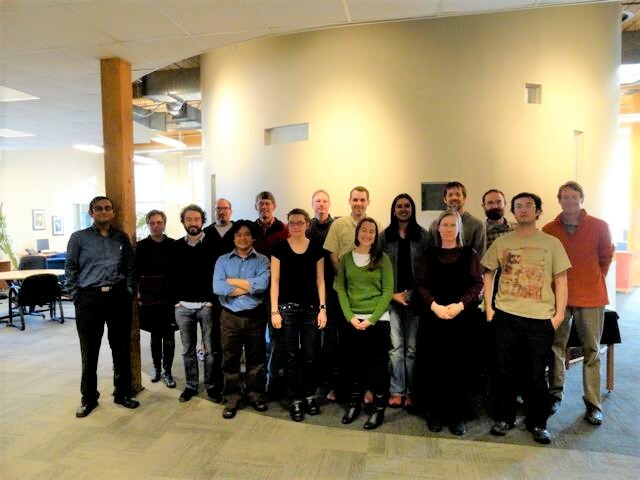 The students involved all participated in contributing new data to MycoDB, and many of them met in January, 2011, for a synthesis meeting during which new analyses of MycoDB were pursued on a variety of questions, and quality control on the new version of MycoDB continued in earnest. This new version of MycoDB contained more than 4000 observations on plant response to mycorrhizal fungi, from 438 original publications, and a Data Descriptor for this new version was published in Scientific Data in 20167. First meeting of NESCent working group, January 2012. Left to right: Sounak Chakraborty, Monique Gardes, Marc Lajeunesse, Wolfgang Viechtbauer, Wittaya Kaonongbua, Brook Milligan, Bridget Piculell, Jim Bever, Brady Allred, Megan Rúa, Bala Chaudhary, Elizabeth Housworth, James Umbanhowar, James Meadow, Peter Zee, Jason Hoeksema. 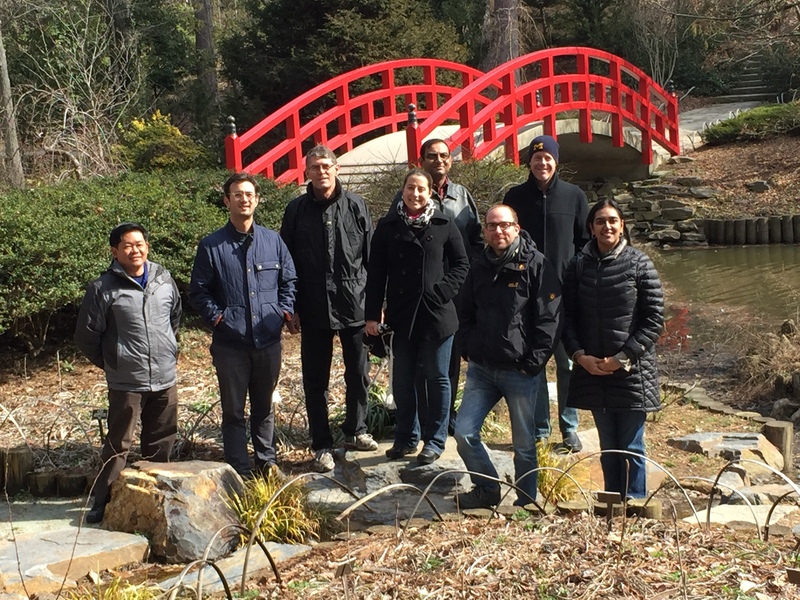 Next, we convened a working group at the National Evolutionary Synthesis Center (NESCent, also a synthesis center funded by the USA's National Science Foundation, which has now morphed into the Triangle Center for Evolutionary Medicine), meeting five times between January 2012 and February 2015 to push forward with analyses of MycoDB. Final NESCent working group meeting, February 2015. Left to right: Wittaya Kaonongbua, Peter Zee, Brook Milligan, Megan Rúa, Sounak Chakraborty, Jason Hoeksema, Bala Chaudhary. A particular focus of the NESCent working group was to link the data on plant response to mycorrhizal fungi with phylogenies of both the plants and fungi, to facilitate phylogenetic meta-analysis. Some new R packages and functions were generated in the process, including the very useful rma.mv() function of Wolfgang Viechtbauer's metafor package. We also conducted separate analyses to test for local adaptation in mycorrhizal interactions8,9, used simulation studies to test different methods for imputing missing data, and used simulations to test approaches for conducting model selection of mixed meta-analytic models. Publications on these simulation studies are forthcoming, but the current Communications Biology paper represents our most up-to-date effort to apply meta-analysis to MycoDB to understand variability in outcomes of mycorrhizal interactions (from the plant's perspective). Building on all the work from more than 100 people over the course of the last 15 years, it applies newly-developed methods for phylogenetic meta-analysis to the most recent version of MycoDB and accompanying phylogenies (which are available on Dryad, along with the R code used in our analyses). A key conclusion from the current paper is that evolutionary history has a large role to play in explaining why contemporary responses of plants to mycorrhizal fungi are so variable. Moreover, the influence of evolutionary history is different in the two major types of mycorrhizal symbiosis we analyzed, arbuscular mycorrhizal (AM) and ectomycorrhizal (EM). Ectomycorrhizal symbiosis has evolved numerous times independently in both plants and fungi, and the different origins of EM symbiosis in plants have left a legacy of differing plant responses to the symbiosis, with much weaker average responses among, for example, the Fabaceae compared to the Myrtaceae. This result is intriguing because the Fabaceae already had evolved a separate symbiosis with rhizobia bacteria in the soil, increasing their ability to acquire nitrogen (through fixation of gaseous N from the atmosphere), which could explain why those plants evolved weaker responses to ectomycorrhizal symbiosis (which often helps plants with nitrogen acquisition). An important future direction will be to more deeply explore the role of ecological context, for comparison with the role of evolutionary history. Our current version of this comparison of ecological context versus evolutionary history, as represented in the Communications Biology paper, suggests a larger role for evolutionary history, but some key contextual factors were not possible to include yet (e.g., ambient light) or were represented by less-than-satisfying proxies (e.g., soil nutrient concentrations). In addition, both AM and EM symbiosis showed evidence for non-independent evolution of plant responsiveness on plant and fungal phylogenies. Although we only modeled drift evolution, an exciting direction for future work will be to extend these models to explore scenarios of selection, including the potential influence of coevolution and variable selective regimes during the evolutionary origins of these ancient symbioses. Johnson NC, VB Chaudhary, JD Hoeksema, JN Moore, A Pringle, JA Umbanhowar, GT Wilson. 2009. Mysterious mycorrhizae? A field trip and classroom experiment to demystify the symbioses formed between plants and fungi. The American Biology Teacher 71(7):424-429. Johnson NC, JD Hoeksema, JA Umbanhowar, J Bever, VB Chaudhary, CA Gehring, JN Klironomos, R Koide, J Moore, M Miller, P Moutoglis, MW Schwartz, S Simard, W Swenson, GW Wilson, and C Zabinski. 2006. From Lilliput to Brobdingnag: Extending models of mycorrhizal function across scales. BioScience 56(11):889-900. Rúa MA, Lamit LJ, Gehring C, Antunes PM, Hoeksema JD, Zabinski C, Karst J, Burns C, Woods M. 2018. Accounting for local adaptation in ectomycorrhizas: A call to track geographical origin of plants, fungi, and soils in experiments. Mycorrhiza 28(2):187–195.